With spring having settled in, it brings with it soaring temperatures and those all too familiar seasonal thunderstorms. As refreshing as the rain can be, it doesn’t come without its dangers. While hail is a particularly notorious problem at this time of year, flash flooding can also be extremely dangerous - mainly for drivers caught on suddenly slippery roads. So, with stormy weather moving in fast, it is vital to prepare yourself for the attack. Keep an eye on the weather. While weather patterns can be unpredictable, large storms can generally be seen coming, so it’s in your interests to keep a close eye on weather apps and reports to ensure you’re adequately prepared for any approaching storm. When the stormy weather makes an appearance, make sure to move your car to an undercover spot and ensure all doors and windows are properly shut and sealed to avoid any water damage. Avoid the roads. If at all possible, avoid being on the road. Try by all means to reschedule your meetings and outings if you’re planned to be outdoors during a storm, should you be unable to reschedule, make sure to keep a safe following distance and check your tyres before driving off to ensure they’re safe enough to handle the wet roads. Make sure to avoid any stretches of deep water or flooded roads, as these can often be deeper than they first appear and can cause significant damage to your car and can also be life threatening. Be prepared. As this is a season of floods and hail, it would be wise to be alert at all times when on the road. Whether it’s a hail storm or thunder showers, stormy weather can be extremely treacherous and can result in significant damage for motorists. And while you might think your sturdy SUV is invulnerable to the threat of water, think again. It takes only 60cm of moving water to lift a vehicle and sweep it away, with tyres essentially acting as flotation devices. Should you find yourself trapped in a flash flood, it’s important not to panic, there is a way out. Understand your insurance. Don’t wait until the bad weather has done its worst to establish whether you and your possessions are covered against storm damage. Make sure to speak to your insurance company and go over the terms of your cover, ensuring you have appropriate insurance in the event of damage to property, cars or other valuables. At least that way, you’ll be able to enjoy peace of mind when those sunny skies start to darken. 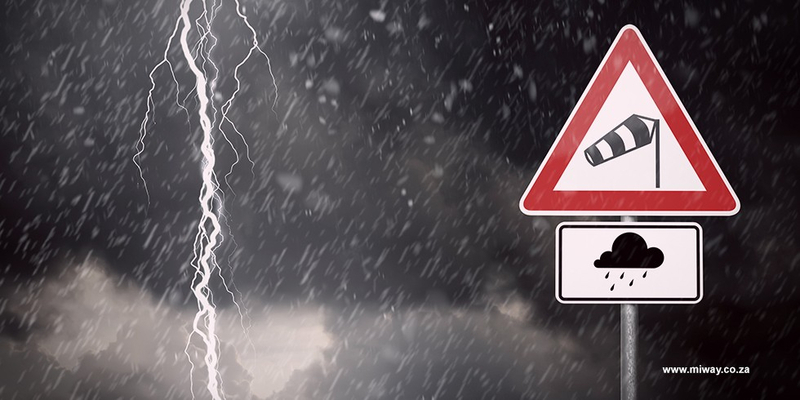 Mother Nature’s mood swings can leave us at her mercy, but by understanding your options when it comes to insurance and being as prepared as possible for whatever she throws at you, you can avoid being a victim.